Longwood Gardens in Pennsylvania is more than just a garden, it far exceeded our expectations. We arrived there around 9am and thought we would be done before high noon, the majority of the high UV indoors at the Winterthur Museum (our afternoon activity). By 11am we were only about 2/3 done wandering the grounds. We were zigzagging every which way in a desperate attempt to stay in the shade for we were not wearing sunscreen. Thankfully all we had left was the greenhouse and other indoor buildings. Not really, because it was even hotter inside. One of the features mentioned in the brochure was a living wall that had been recently designed. 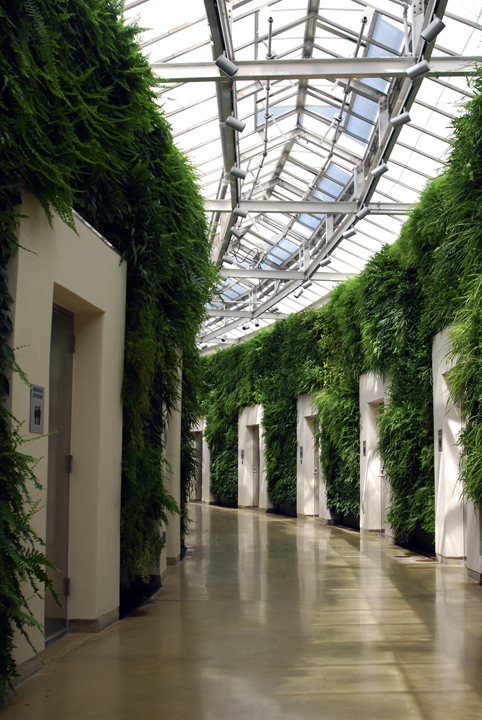 It was designed so vines and plants would grow vertically creating a giant wall of greenery. We wandered around the building in search of this cool sounding (and newly added) thing. It was all the way at the back. The green wall was along the hallway where all the bathrooms were. Yup, that beautifully designed, curving hallway of greenery with a glass ceiling is just a hallway full of individual toilets.